High Purity Alumina Market size was estimated over USD 1.21 billion in 2017 and will exhibit growth of over 15.8% up to 2025. High purity alumina market is mainly driven by its increasing applications in LED lighting, plasma display screen, semiconductors, lithium ion batteries, photovoltaic cells, phosphor, optical lenses, hybrid cars, sodium lamps, smartphone sapphire glass etc. The product is a processed premium non-metallurgical form of aluminum characterized by its purity level. It possesses characteristics such as high melting point, high electrical insulation & resistance, chemical stability and good thermal conductivity. Recent developments in the automotive industry, booming LED lighting and synthetic sapphire demand, rapid development of cities, new potential uses of aluminium as a substitute to copper in the power industry and many other trends will strengthen the high purity alumina (HPA) market growth. In medical industry the product also provides ready-to-use solution for bioceramics in orthopedic & dental treatments and REO-doped YAG crystals for medical imaging. High purity alumina market is witnessing steady growth in the semiconductor industry, as the product is a fairly new industrial-use material employed in the process of fabrication of semiconductor device. It is also used in wafer processing equipment owing to its high resistance to plasma corrosion and improved blending strength. Demand for semiconductor is influenced by several underlying applications such as data processing, communication and consumer electronics, that accounts for the prominent share of applicability in personal computers, tablets, gaming consoles, television, iPods and servers. Hence, growing demand for high definition display screens is expected to augment the high purity alumina market demand in the forecast timespan. 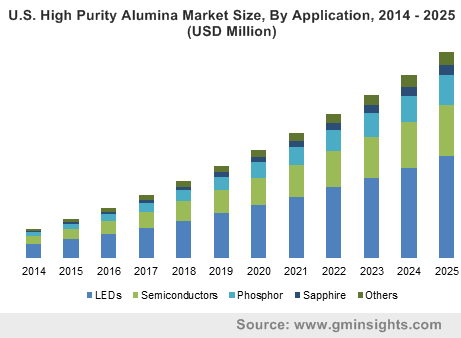 Rising applicability of LEDs in the lighting market coupled with advanced utility of high purity alumina in, smartwatches, smartphones and tablets, will generate lucrative opportunities for medium to small scale manufacturers. However, threat from substitutes and higher cost of production in some of the end-use segments, are likely to affect the HPA market. Based on technology, the high purity alumina market is segmented into hydrolysis and HCl leaching. Hydrolysis technology accounted for more than 70% of the overall market share of high purity alumina market in 2017. The hydrolysis of aluminum alkoxide is the most adopted method by major manufacturers to produce HPA. In this process, HPA alkoxide is synthesized using alcohol and aluminum metal that later undergoes hydrolysis to obtain hydrated alumina. This processing technology facilitates the retention of acid for further usage, thereby reducing operational costs. In terms of revenue, HCl leaching accounted for over USD 300 million in 2017 of the global high purity alumina market. HCl leaching process uses hydrochloric acid instead of caustic soda to extract alumina from clay, the particles are acid-leached using HCl at a high temperature and pressure to extract specialty product. However, this process is not commercially feasible yet, but it has great prospects to be implemented in future. Based on product, the global high purity alumina market has been segmented into 4N, 5N, and 6N. Based on volume, the 4N segment is said to hold the maximum share of over 70% due to significant usage of lithium-ion batteries. The product also has extended application in ultrafiltration & gas separation laminates due to its enhanced chemical resistivity and porosity. Recently, both developed as well as developing nations are shifting towards LED lighting systems to avoid energy crisis. For example, government of China is offering lucrative subsidies for LED production to manufacturers to flourish the LED industry in the country. Based on revenue, the 5N segment held a substantial market share of more than 30% owing to its extensive usage in in sapphire glass, electronic displays, medical and aerospace applications. 6N is poised to gain moderate market share from 2018 to 2025. 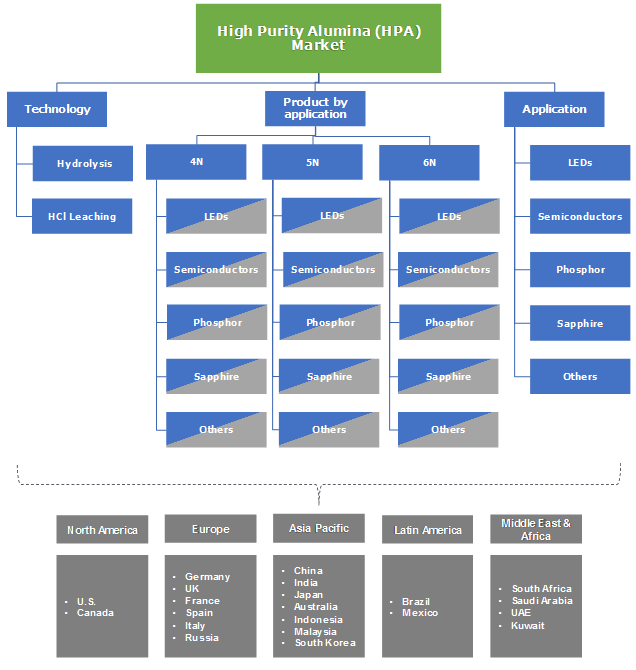 The global high purity alumina (HPA) market has been segmented on the basis of application into LED’s, semiconductors, phosphor, sapphire, and others. The others segment includes Li-ion batteries. In 2017, LED segment held a prominent share of more than 50% of the global high purity alumina market. Increasing population coupled with advanced living standards has significantly upsurge sustainable and energy efficient products. For instance, the Indian government announced several policies to promote LED industry development and reduce energy consumption by providing a cash endowment of up to 20% of the cost of the project to companies that establish semiconductor fabrication plants under its Modified Special Incentive Package Scheme (M-SIPS). This trend is projected to boost the overall industry growth during the forecast spell. In 2017, semiconductor industry held the second highest market share of the global HPA market and will witness growth at over 18% CAGR from 2018 to 2025. Phosphor based products such as plasma display panels (PDP) that are made of phosphor coatings in plasma cells account for yet another share of HPA application. Based on revenue, Asia Pacific region will foresee significant growth owing to rising demand for technologically advanced consumer electronics in China that held a regional market share of over 45% in 2017. In the same year India witnessed moderate growth due to adoption of government policies to encourage LED industry for sustainable energy consumption. India accounted for close to USD 40 million in the high purity alumina market and is said to exhibit gains with over 16% CAGR during the forecast spell. North America held a market share of close to 15% in the global high purity alumina market. Positive momentum of U.S. housing market will propel HPA demand during the forecast spell. In 2017, Brazil high purity alumina market was valued over USD 50 million and will grow with an adequate CAGR during the forecast timeframe. Altech Chemicals Limited, Baikowski SAS, Polar Sapphire Limited, Nippon Light Metal Company Limited, Alcoa Corporation, Orbite Technologies, Sasol, Sumitomo Chemical, Rio Tinto Alcan, UC RUSAL, Norsk hydro are some of the prominent players operating in the global high purity alumina market. Alcoa Corporation is among the top producers of aluminium. In 2016, Alcoa Inc. got spit into two entities namely Alcoa Corporation and Arconic with former engaged in mining and manufacturing of raw alumina and the latter engaged in processing of alumina and other metals. The high purity alumina market is directly related to the presence of bauxite reserves from which alumina is extracted globally. HPA has worldwide usage in LED’s, semiconductors, phosphor, sapphire, Li-ion batteries, ceramics etc. Moreover, increased disposable income will drive up the private vehicle ownership, which will eventually increase overall LED’s projects globally. Lucratively increasing product demand in abrasives industry on account of superior hardness., will further propel the high purity alumina market industry. Further, product application in coatings industry due to high resistance to temperature is expected to drive growth.